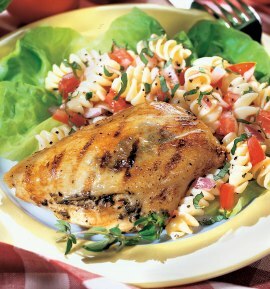 I just love this pesto grilled chicken recipe from Rose Murray’s new cookbook 125 Best Chicken Recipes . The small amount of pesto sauce stuffed under the skin of these chicken breasts not only gives them a wonderful flavor, but helps to keep them moist while they cook. It really is delicious. Grease a barbecue grill and preheat to medium-high. Gently poke your fingers under the skin of each chicken breast and lift the skin slightly. (Be careful not to tear the membrane that connects the skin to the chicken.) Gently stuff 2 tablespoons of pesto into each breast, massaging to even out the pesto over the chicken breast. Starting with the pesto-side up, grill the chicken for 5 minutes. Turn the breasts and grill for another 5 minutes. Turn again and finish on the grill with the pesto side up for 5 to 7 minutes or until the chicken is no longer pink inside. For the Fresh Tomato Pasta: Meanwhile, in a large pot of boiling salted water, cook the pasta until tender but firm. Drain well and toss with the oil. While the pasta cooks, core the tomatoes and coarsely chop. In a bowl combine the tomatoes, onion, garlic, basil, oregano, vinegar and sugar. Add the salt and pepper to taste. Toss with the pasta and serve immediately. You can use an indoor grill as well if you can’t barbecue. The barbecue does give the chicken an amazing flavor of course. I love that Rose not only gives us the recipe for these fantastic grilled chicken breasts with pesto sauce, but also the perfect “go with” side dish, pasta with a light fresh tomato sauce. Add a side salad with vinaigrette if you want and dinner is ready. The nice thing is that you already have some fresh vegetables in the pasta sauce recipe, so if you really don’t want to make a salad, you don’t need to. You will find our review of Rose’s new cookbook, where this terrific grilled chicken recipe came from, here. Browse all of our Italian recipes here. This recipe comes courtesy of 125 Best Chicken Recipes by Rose Murray © 2014 www.robertrose.ca Reprinted with publisher permission.